Arsenal lost 3-1 to Manchester United in the fourth round of the FA Cup. Arsenal started this FA Cup fourth-round tie in good form. The Gunners were sharp with Aaron Ramsey finding a great deal of space in the opening ten minutes but that soon went away. Things really came undone for Arsenal when Sokratis Papastathopoulos was forced off the pitch. Shkodran Mustafi was his replacement and the German instantly came under a great deal of pressure. 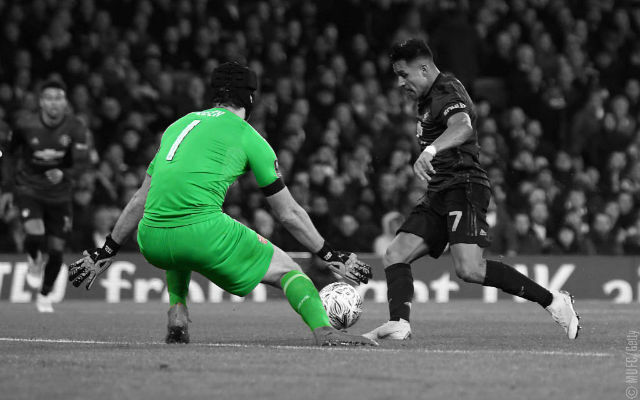 The Gunners were adrift defensively as Romelu Lukaku found Alexis Sanchez who, of course, rounded Petr Cech to score. The Gunners looked rattled and United really took advantage of the situation. The visitors countered quickly and found a 3-on-2 situation as Jesse Lingard found a great deal of space to make it 2-0 within the space of two minutes. Arsenal needed to respond instantly and it took them less than ten minutes. Aaron Ramsey found some space down the left and played a fine ball across the face of goal for Pierre-Emerick Aubameyang to score at the back post. The second half began with Arsenal in the ascendency and they very nearly equalised within a minute. Aaron Ramsey connected well with a front-post header and produced an incredible save from Sergio Romero. The tempo of the game remained high but neither side seemed capable of creating chances. Ramsey’s header remained the best chance of the half before United pushed forward and killed the match. Paul Pogba’s shot was saved well but Petr Cech but the Czech goalkeeper could do little to stop Anthony Martial’s follow-up. The game petered out in the remaining ten minutes as the Gunners headed for a fourth-round exit in the FA Cup. He didn’t have a great deal to do this evening. Petr Cech only faced two shots on target in the first 80 minutes of this match and both resulted in goals for Manchester United. 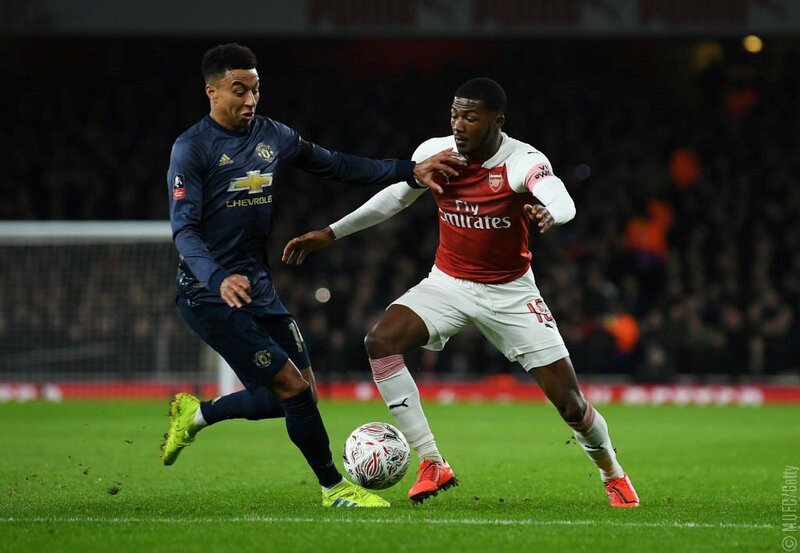 Ainsley Maitland-Niles did fairly well this evening. The youngster’s positioning was a little erratic but when he held his own in the individual duel with Alexis Sanchez. It was such a shame to see Sokratis head off the pitch with an ankle injury. The Greek defender has been in fine form lately and started this one well too. He hardly filled the back four with confidence. The back four instantly looked more fragmented once Shkodran Mustafi took to the field and the German really should have done better for both of United’s goals. Barring that disastrous ten-minute spell in the first half, Laurent Koscielny played reasonably well. It was such a shame to see the Frenchman replaced. Matteo Guendouzi was typically full of enthusiasm and attempted to make a mark on the match but things didn’t quite work out for the Frenchman. He struggled at times this evening. Sead Kolasinac was caught too high up the field on too many occasions this evening. That is nothing new but the full-back didn’t justify it at the other end. He’s played better. Lucas Torreira was caught too high up the field for United’s second goal and spent much of the match too far apart from his midfield partner. He struggled. Granit Xhaka could get a hold on the game as Arsenal lost in midfield. The Swiss midfielder did reasonably well dropping back into the defence. It wasn’t really his night. Alex Iwobi drifted in and out of the match and was a little one-dimensional when he had the ball. Mesut Ozil didn’t have the desired impact on the match. The German playmaker started well but grew sloppy and careless in possession. Aaron Ramsey started well but disappeared out of the match as it progressed. The Welshman was the best player on the pitch in the opening 20 minutes but couldn’t get a sniff of the ball after that. He was unfortunate not to find the equalising goal just after the break. Pierre-Emerick Aubameyang grabbed his regular goal but will be a little disappointed with his evening. He looked a little isolated up front for large spells of this match. He was Arsenal’s best performer by some distance. Alexandre Lacazette was the most creative and threatening player in the Gunners’ attack and was unfortunate not to get on the scoresheet.